I’ve been running this fashion blog for 3 years now. As you’d imagine the clothes, shoes, accessories and jewelry start to stack up. 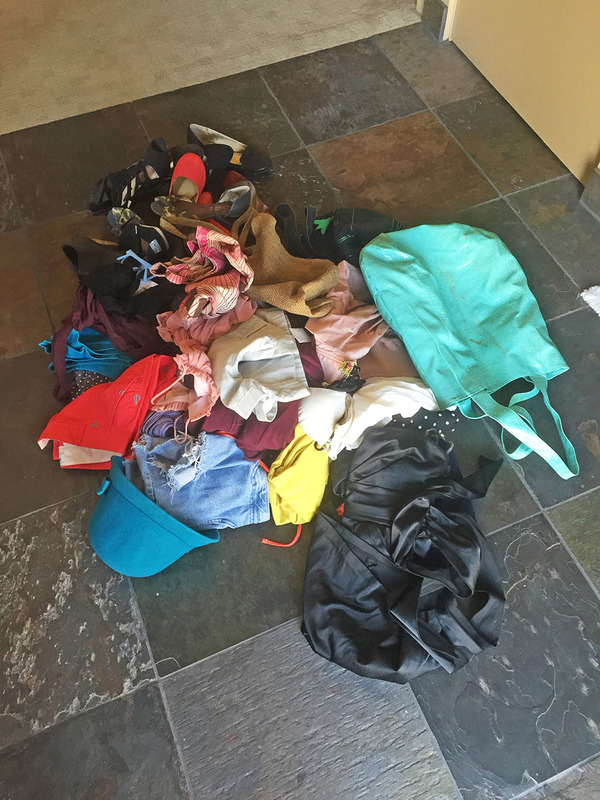 **note: all these photos are taken after slowly cleaning out my closet over the last 6 months. I still have a long way to go but am trying to reflect on some progress. 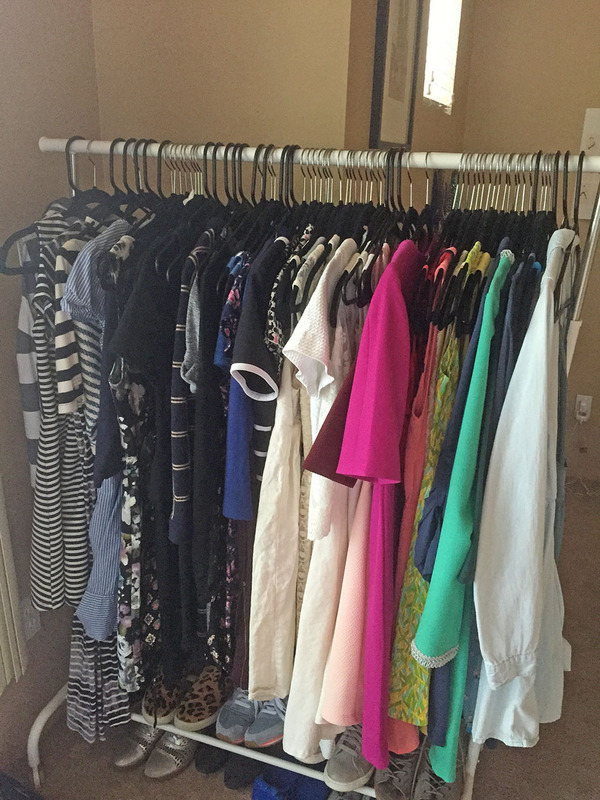 If you’d like to see my previous wardrobe storage tour in my old place, click here. During year 1 of the blog, I wanted to share how to remix your closet with items you already own. I slowly started adding new pieces where I found fit. After year 1 I realized I didn’t own many basics. I was super drawn to loud prints and bright colors which doesn’t allow for easy outfit combinations. My style back then was definitely more vintage, thrifted and girly. Year 2 became focused on incorporating basics and neutrals and learning they don’t have to be boring. I was also interested in finding what worked best for my body type and colors that best suite my skin/hair. Now we’re starting year 3 and I want a detox. I don’t want items in my closet that take up space and never get worn. I want items that I look forward to wearing and don’t tatter, ball up and rip so quickly. Plus the name “Colour Me Classic” was and is about selecting timeless pieces that you will love even one year from now. I’ve majorly paired down the amount of necklaces I own, although it still looks like a clutter. I still want this area to be something I can just easily select from and not have to dig threw. Life is crazy as is and your wardrobe shouldn’t add to that stress. I just did a huge purge of items this afternoon. Spured by the fact that I don’t live here during the week and I started noticing when I come home on weekends I often don’t want to be in the space where I live because it doesn’t feel serene, calm or organized. I’ve been listening to The Lively Show podcast daily and came across this episode, which talks about only holding onto items that bring you joy. The theory is you need to physically hold each item and let go of any unnecessary rationalization behind keeping the item then decide if it meets the joy factor or not. Shoes are my biggest love/weakness. 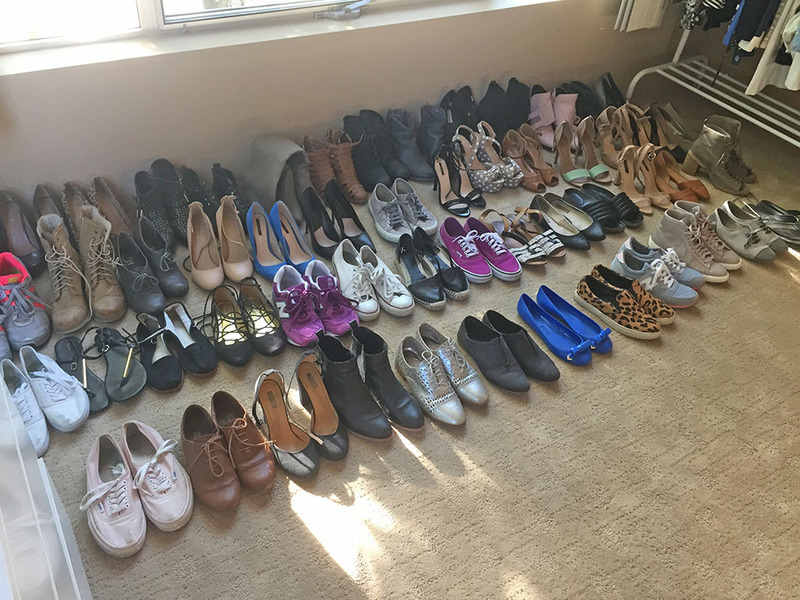 This photo is an extremely paired down collection and is every pair I own now. I used to have bins full of old ones, half I’d hadn’t worn in years. This still looks ridiculous but I’m working on it one day at a time. The podcast really inspired me to clean up and give this theory a try. I just started stuffing things in bags. Many of the items I didn’t even try on, I just knew I didn’t enjoy find joy in them anymore. I knew if I dumped it out I could get a real sense of how many items I was housing for no reason. It is/was getting to the point where it’s hard to find things because drawers were just too buried. At the same time I started thinking things like, “oh I bet I could give this to blah blah” or “I could totally sell that at consignment store” or “oh I think I should keep those shoes because they’re a pop of color, even though they kill my feet.” After all the crazy rationale, I dumped everything out and snapped this photo on the floor, then ran to Goodwill and never looked back. It’s gross how we can keep all this stuff around. I do have a hard time letting go of items. Keeping a lot of junk around and loving super clean/modern aesthetics don’t go well together. We recently moved into a new loft that doesn’t have much built in storage and I’ve been majorly slacking on buying anything in that regard. We gave away our old nightstands and we haven’t replaced them 2 years later! How does that happen?! 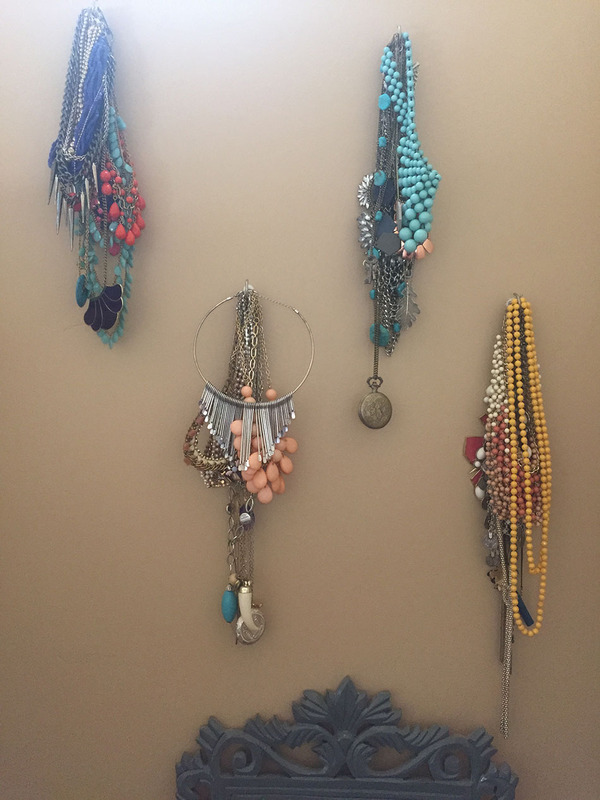 I wanted to downsize what we owned and get creative with storage before I bought any permanent pieces since we are renting. I don’t know why but owning these very same items in my old house didn’t effect my mood or well being. It was a cute victorian with tons of storage. Now that we’ve lost the linen closet, cleaning supply closet and the 2 walk in closets it has become an adjustment period. I feel so good about being able to let go of items. 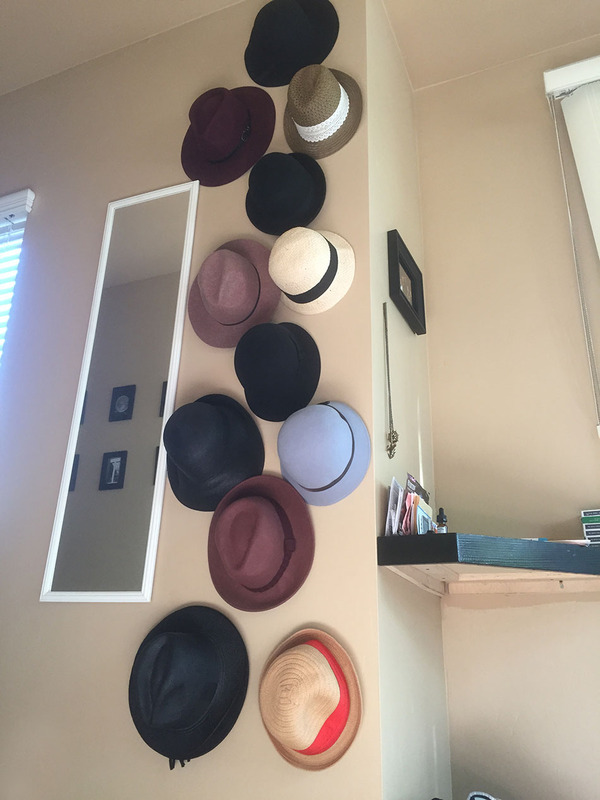 I finally bought a standing rack since the last closet tour and am trying to coordinate by colors and stripes. If you’d like to read about a capsule wardrobe or the blog Unfancy, click here to start with her about page to understand “the why” behind her idea. Thank you for letting me, in a sense, air my dirty laundry on this platform. Each day I am aiming to make my online and offline space more real, more me and less perfectly curated. How are we suppose to learn and improve if we’re always focused on outward appearances? I think I’ve cut my closet into 1/3 since moving and I feel so good about the progress and hope to keep going. Maybe this will inspire you to take a closer look at what you own. Our belongings should bring us joy not anxiety. Here’s to smart shopping and simpler living. Cheers to year 3 and living a life that feels as good on the inside as it does on the outside! Preview Previous post: Camel & White. i definitely do the same thing– like “oh, but one day if i maybe go to a really hip music festival i’ll wear this vest” lol. when in reality, it’s just collecting dust!